On Monday, March 19, 12:40 A.M., George Rocco Marshall drew his last breath. George Marshall III (Rocco Marshall) was born on September 20, 1954 at Flower 5th Avenue Hospital on the Upper East Side of New York City to Princess Summer-Fall-Winter-Spring and a rodeo-riding soldier. Rocco had a tumultuous but love-filled childhood and found solace at the age of 13 in a Sears Silverstone Guitar. His decision to wield a 6-string directly influenced every aspect of the rest of his precious, eventful life. Rocco’s musical imprint and tremendous legacy will forever be remembered by the thousands of lives he touched with his guitar playing throughout the world. His vast catalog of compositions, both solo and with the bands Vision (1984ish-1988ish? ), Rocco Marshall and the Truth (1997-2000), and his musical join ventures with his daughter, Aaron Marshall, reflect his thoughtful and complex nature as a person and artist. His style and technique were effortless and when paired with his charismatic personality. Rocco’s unstoppable persona afforded him some amazing and unique opportunities. On March 17, Rocco suffered his 4th cardiac episode since the beginning of the year due to complications from Diabetes and Renal Failure.Rocco’s family made the painful and difficult desicion to allow himto exit this world peacefully and without pain. In complete defiance of all expectations, Rocco hung on to his life for 13 hours after life support was removed. During that time, his family played him some of his favorite music and Aaron sang of his favorite songs. He passed in an absolutely serene state surrounded by family and endless amounts of love. Rocco leaves behind a heartbroken and devastated family and friends who loved him deeply. Instead of getting lost in sadness, rather, Rocco would want you to remember and laugh at his silly voices or being on the receiving end of one of his epically hilarious “13th Annual Tossing-The-Shorts Competition” prank calls. Recall his super-serious and intense guitar-soloing faces and his infectious laugh and smile. Most of all, let’s remember his ability to love. 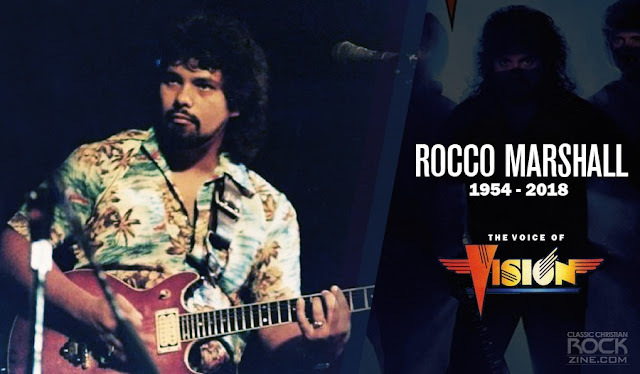 So today, listen to some of Rocco’s musical endeavors (you can find it via the search “Vision Christian Band” on YouTube or by searching Rocco Marshall on ReverbNation if you don’t have a CD). Throw in Steely Dan’s Aja, Chick Corea and Return to Forever’s Light as a Feather, or Led Zeppelin I-IV and raise a glass to a man who touched so many lives, Rocco Marshall. Rocco is survived by a huge, loving family along with thousands of friends; Daughter Aaron DeCicco, Son Connor Marshall, Granddaughter, Katalyn Mariana DeCicco, Sisters Debbie Mitchell, Terri Kemp, Brothers, James Gormley and Steve Gormley. Services will be held Tuesday, April 3rd, 2:00P.M. at CrossRoad Church, UMC 10005 Gate Pkwy. Jacksonville, FL., 32246.